Do you struggle to find the time to plan out therapy sessions? These no-prep activities encourage fine motor and executive function skills with a Winter theme. And… they are FREE! The black and white pages are super easy to print off and start working with students right away. 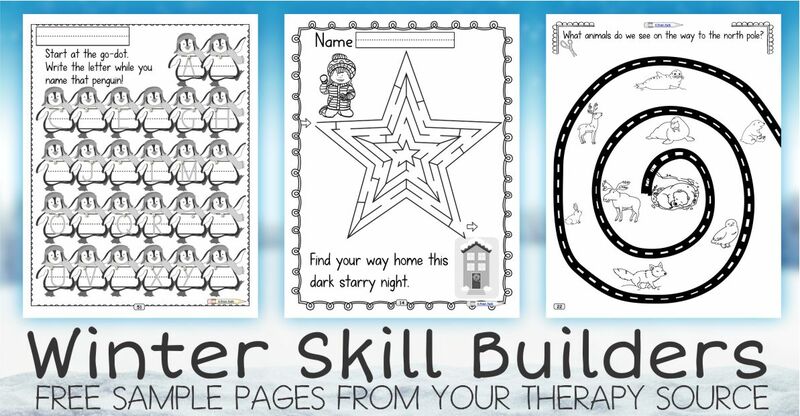 This three-page free sample download is from the Winter Skill Builders packet, created by Thia Triggs, school-based Occupational Therapist. Teacher’s Guide for each of the six units. Occupational Therapy tips and tricks for explicit instruction, developmental sequence, and breaking tasks into their smallest steps so all children can learn. Specific differentiation tools and support. 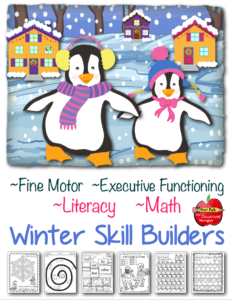 Specific objectives for fine motor, visual motor, and executive function skill development. Detailed table of contents so you can easily find what you need at a moment’s notice.